It is a widely spread Japanese game. Pachinko is not very popular in the USA but it is extremely popular in Japan. It has a lot in common with a vertical pinball game. Beginners are recommended to learn as much as possible about payout scheme for each game you want to play. You should take into account that the payout may slightly differ from each other. Pachinko appeared in the 1920s. Firstly, it functioned as a children`s toy and it was called Korintu Gemu, not Pachinko. Initially it was a game for home usage only, but in the course of time it was transformed into a machine with a help of which children could get such winnings as fruits, sweets and pencils. Later on adults also were engaged in playing this game. As a result, winnings were changed into vegetables, tobacco or soap. At the end of the 1920s this slot machine has changed its design (metal spring instead of wooden one and new machine glass covering). Also the name of the game was also changed and now it was called Gachan/Gachanko. In the 1930s the name Pachinko was introduced. Gradually this game was becoming more and more popular. The War times slowed down the Pachinko development but in the 1940s this game became popular again. An incredible Pachinko boom was observed in the 1980s with new technology integration. 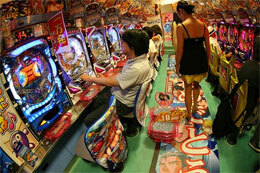 Modern Pachinko hasn`t heavily changed. It has undergone only minor modifications in its design. Your task is to get balls in the gates of the Pachinko board. Actually, there are many various Pachinko slots with different design, graphics and animation. Gambling is prohibited in Japan, so parlors do not give the cash. You may exchange the balls you have won for prizes or cash. Pachinko is considered to be the greatest sort of entertainment among Japanese people. But it is currently observed that this game is reaching a growing popularity in many other countries. Do not miss a chance to play this amazing game!